Sacco's incumbent slate stands by the claim of gathering some 10,000 petitions. It filed only slightly more than 1,100 with the township clerk. 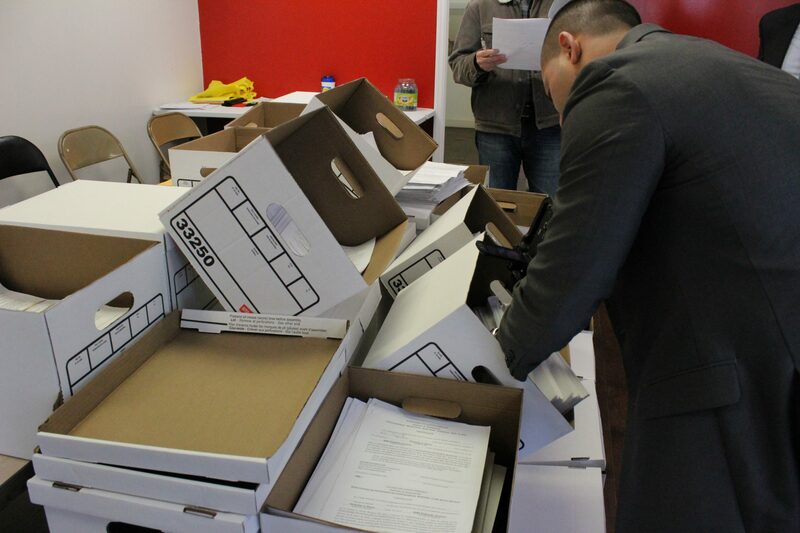 Reporters examined boxes of petitions gathered by the Sacco campaign. Larry Wainstein, Mayor Nicholas Sacco’s opponent in the May 14 mayoral election, has called into question the number of electoral petitions that Sacco and his four running mates received before the deadline of March 11, after finding that most of the petitions they collected were never filed with the township clerk. Three days before that deadline, on March 8, Sacco announced that he and his candidates received close to 10,700 petitions, indicating that roughly 15 percent of the township’s population supported Sacco’s incumbent slate. They showed the press several boxes, visibly containing thousands of petitions that reporters looked through. After filing an OPRA request with the township clerk, Wainstein revealed that Sacco’s slate filed only about 1,100 petitions in the clerk’s public office, close to the number required to make it onto the ballot. Wainstein characterized the claim that Sacco had gathered more than 10,000 petitions “more smoke and mirrors by a 35-year incumbent that has lost touch with the people of North Bergen” after discovering that only 1,100 petitions were filed. The cause of the confusion? Sacco’s team held onto a majority of the 10,000 petitions they said they gathered, and didn’t file them with Township Clerk Erin Barillas. Because these petitions weren’t filed with Barillas, they’re not in the public domain, and they would therefore not be available through an OPRA request. The fact that most of the petitions were never filed was never addressed in any public statements made by Sacco’s campaign. Since Sacco’s team didn’t file all the petitions it received, those petitions were not officially counted before filing deadline. The figure of more than 10,000 petitions, well in excess of what was filed, can’t be backed up by a government office because the deadline to file has passed. 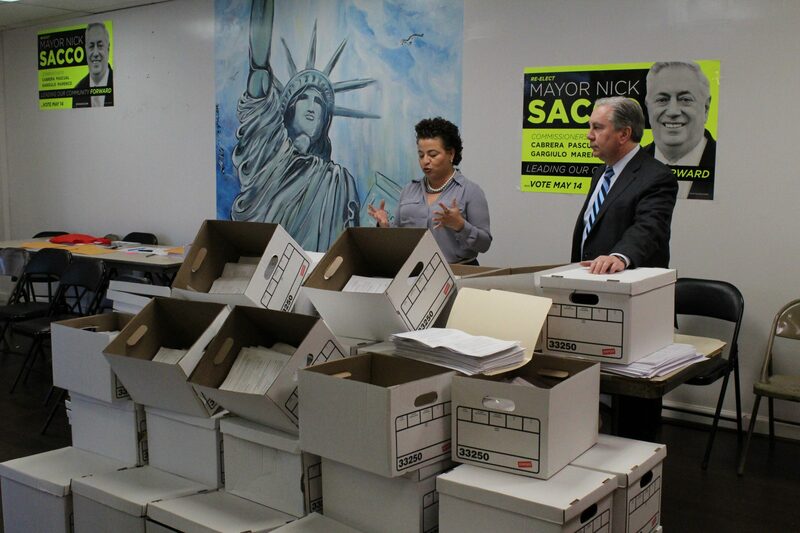 County Freeholder Anthony Vainieri, who is a chair for Sacco’s campaign, said that Sacco’s team retained the purported 10,000 petitions because the township clerk’s office would have to spend two weeks working overtime to process them. This would prevent her from completing her daily work functions. A video uploaded to YouTube on March 24, titled “Mayor Sacco lies about petitions,” depicted Wainstein questioning the township clerk after receiving only about 1,100 Sacco petitions through an OPRA request, despite the Sacco campaign boasting a total of more than 10,000 signatures. On March 26, two days after the video was uploaded to YouTube, reporters were invited to Sacco’s campaign headquarters on Kennedy Boulevard to get a response to Wainstein’s allegation that the Sacco team did not have the number of petitions they claimed to have. Vainieri claimed again that more than 10,000 petitions were gathered before the deadline. He stood behind a display of boxes, like the one presented during the drop-off on March 8. Though no reporter counted the petitions, most agreed that the number was in the thousands. Wendy Martinez, a member of the Sacco campaign, said that Wainstein had attempted to “discredit an amazing accomplishment by Mayor Sacco and his team,” by questioning why the township clerk had only 1,100 petitions on record nominating Sacco’s slate. “Video clearly shows Mayor Sacco talking about the team getting all of these petitions but not actually filing them,” Martinez said. Like Wainstein, reporters at the March 8 press conference were unaware that Sacco’s team planned to withhold the majority of its petitions.